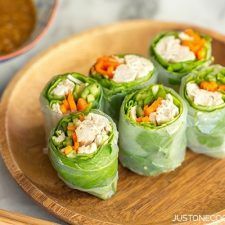 These Chicken Spring Rolls are one of my favorite foods for a summer lunch. 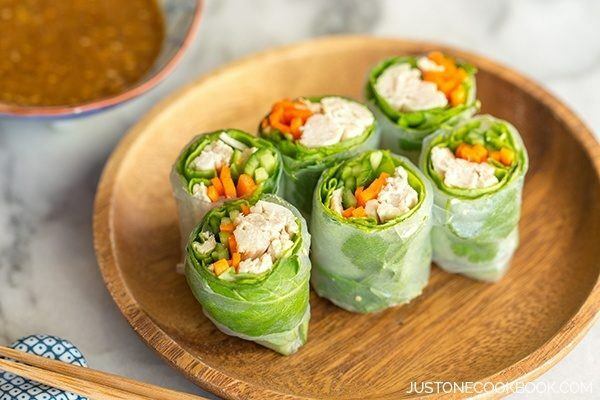 Heaps of refreshing vegetables, fresh mint, and chicken, all wrapped up in rice paper rolls and ready to dip in a delicious, savory sesame sauce. I’m really excited to share this recipe Chicken Spring Rolls with you. It’s easy, delicious, and perfect if you are looking for a light snack or appetizer to enjoy during beautiful spring and summer weather. With plentiful of vegetable ingredients, these spring rolls tastes fresh and crisp as you bite into them. The sesame sauce that goes along with the spring rolls is my favorite part of this recipe. So delectable! 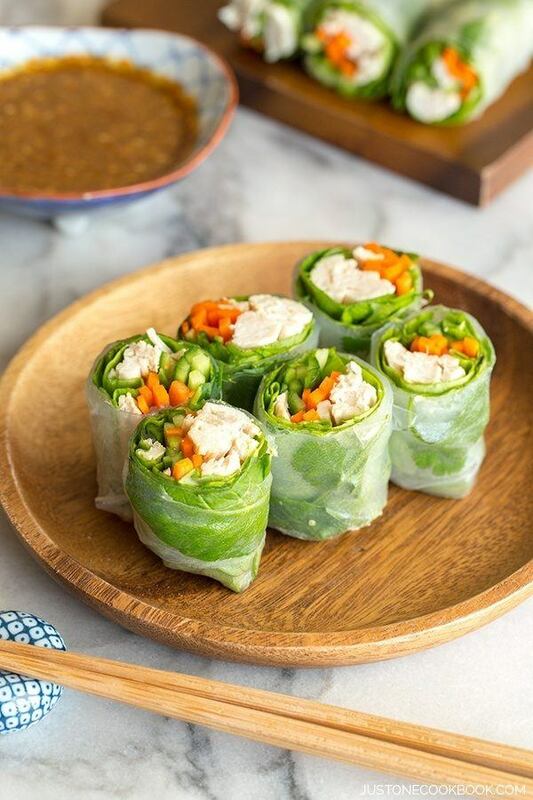 Delectable spring rolls with carrots, cucumber, mint, chicken, and butter lettuce wrapped in a thin rice paper, dip in savory sesame sauce! This recipe was actually a deconstructed version of my Bang Bang Chicken (Bang Bang Ji) recipe. It’s a Sichuan dish made with poached chicken that are shredded into small pieces and then poured with spicy sauce made with sesame paste and rice vinegar. It’s usually eaten with julienned cucumber, chopped scallions, sesame seeds, chilies, etc. Well, just to clarify, my Bang Bang Chicken (棒棒鶏, バンバンジー) recipe is Japanese interpretation of the Chinese dish. The Japanese Bang Bang Ji is not spicy at all like traditional Bang Bang Ji. I put a little bit of La-Yu (Japanese chili oil) in the sauce but my children who do not eat spicy food still enjoyed it. Just like how traditional Bang Bang Ji preps its chicken, I poach the chicken in boiling water and cook it through on low heat. 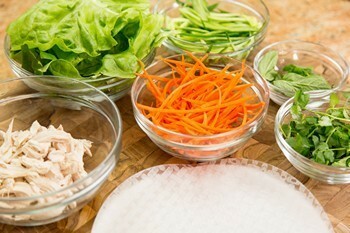 While waiting for the chicken, you can chop other ingredients for the spring roll. The ingredients for this recipe are pretty simple and available everywhere so I don’t think you will need any other substitutes. However, you’re free to substitute my ingredients with your favorite veggies, herbs, or protein (instead of chicken, tofu, for example). 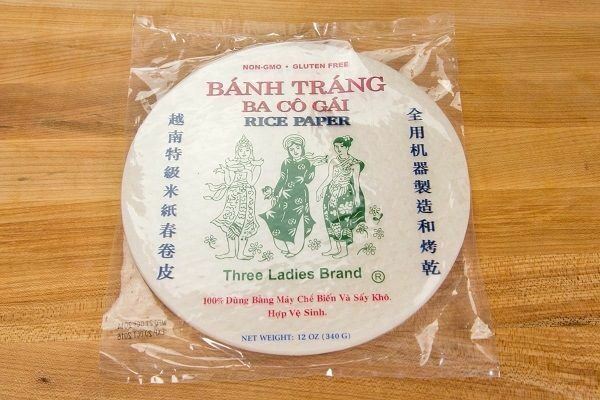 If you plan to serve this dish for a party and need to make it ahead of time, it’s very important that you pick the right brand of rice paper. I’ve tried several brands and this Three Ladies Brand works THE BEST. 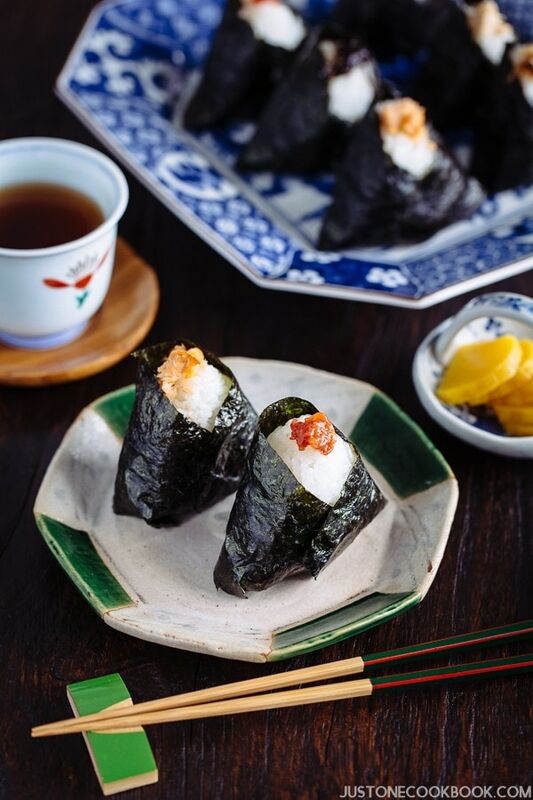 The rice paper doesn’t become hard after several hours, and the rolls can be easily separated without breaking even when they are touching with each other. If you haven’t used rice paper before, the wrapping part might be a bit intimidating. However, unlike Harumaki (Japanese egg rolls), you don’t have to deep fry them, so don’t worry too much about tearing or shaping them perfectly. Some people are good at making it neatly even at their first attempt (definitely not me), but this kind of cooking skill just requires several practice runs to make it look pretty. After wrapping 20 rolls, trust me, your will get hang of it and your spring rolls will look awesome! Just take your time, and remember to “tuck in tightly” so the shape will look nice after you cut in half or thirds. Now if you are very health conscious, the amount of sugar (3 Tbsp sugar) that goes into the sauce might raise your eyebrow. Yes, it definitely doesn’t sound too healthy, does it? 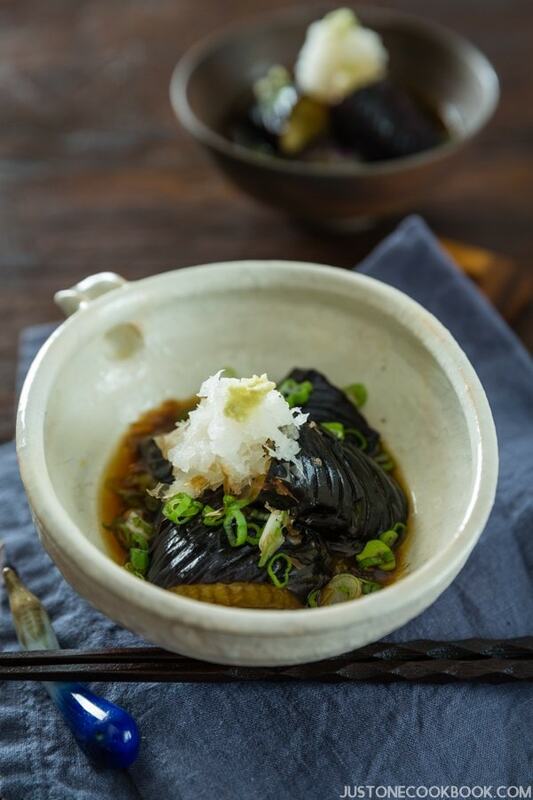 I did test this recipe with less sugar, trying to make this dish “healthier” but the result just wasn’t the same. I still like the original sauce recipe and decided to keep it the way it was. So please adjust the amount of sugar as you like. Or dip just a little bit like I do. Remember, you’re not eating the sauce, and the sauce is there to enhance the flavor of fresh ingredients you’re eating. For the sauce, grind 2 Tbsp. toasted sesame seeds in your mortar and pestle. Transfer the ground sesame seeds into a small bowl. Then grate the ½” ginger and 1-2 garlic cloves (I used Micropane grater). Add 3 Tbsp. sugar, 3 Tbsp. soy sauce, 2 Tbsp. rice vinegar, 2 tsp. sesame oil, and 1 tsp. la-yu in the bowl and mix well. Set aside. Chop the scallions into 3 pieces. Slice 1” ginger into thin slices. Butterfly the chicken breast (See Note 2). First remove the tender (small inner fillet) by cutting away any connective tissue. Turn the breast over and with the edge of a knife parallel to the cutting board, cut the length of the side of the breast. Carefully slice the breast in half widthwise almost to the other edge. Keep the edge intact and open the breast along the fold. In a large pot, add water, 1 tsp. salt and 2 Tbsp. sake that is enough to cover the chicken. Put sliced ginger and scallions and bring it to a boil. Once boiling, put the chicken (breast and tender) in the pot, reduce the heat to the lowest setting, and cover the lid. Cook the chicken for 15 minutes. Meanwhile, juliene carrot and cucumber. I use a juliene slicer but if you don’t have one, cut into thin sheets first and then cut into matchstick size strips. Take out the chicken from the pot onto a plate and immediately cover with the plastic wrap to prevent from drying. Once the chicken has cooled, shred the chicken into small pices with your hands. Rinse the butter lettuce, mint, and cilantro under water and dry completely. Set all the ingredients on the working surface. Pour hot water in a large bowl. Working with 1 wrapper at a time, soak the wrapper in the hot water and rotate 2-3 times, about 10 seconds. The wrapper will still feel slightly stiff but don’t worry, it will become softer. Place it flat on a working surface. Lay the butter lettuce, chicken, carrot, and cucumber at bottom 1/3 of the wrapper closest to you, and place the mint and cilantro leaves at the top 1/3 of the wrapper. Pressing firmly down to hold the filling in place, fold the bottom of the wrapper and start rolling tightly. Around the middle of the wrapper, fold both sides of the wrapper in and roll up tightly to the top. Place on a plate and cover loosely with plastic wrap and repeat with the remaining wrappers and fillings. 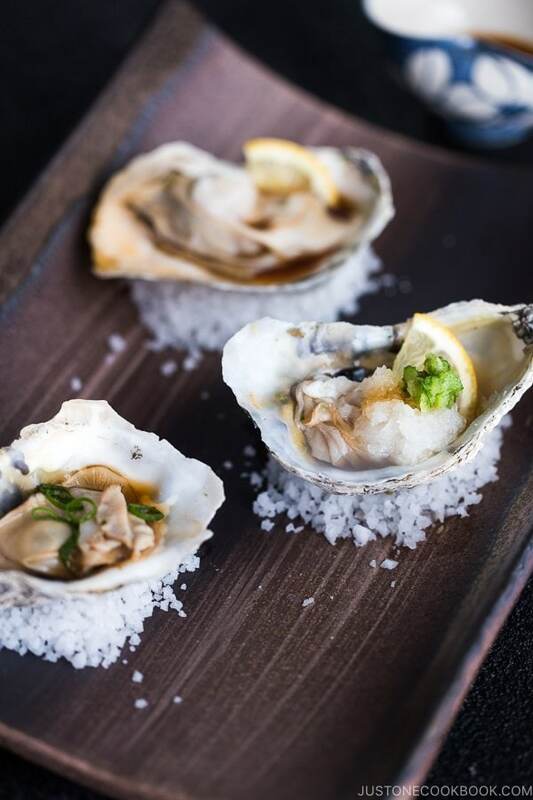 Cut in half or in thirds, and serve with the Sesame Dipping Sauce. If not serving immediately, keep the spring rolls tightly covered with plastic wrap at room temperature for up to 2 hours. 1: We use sake to remove the odor of chicken. You can skip if you can't take alcohol. 2: Butterflying is a really useful technique to create a uniform thickness throughout a piece of meat, so that it will cook more quickly and evenly. 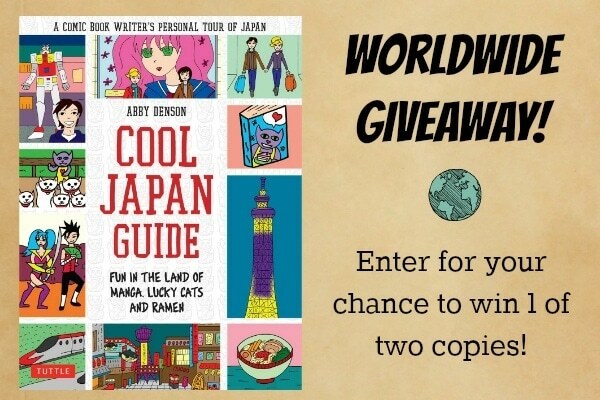 Update: Each month 20% of proceeds from selling my eBook will go to charity. For March 2014, I donated to International Rescue Committee. 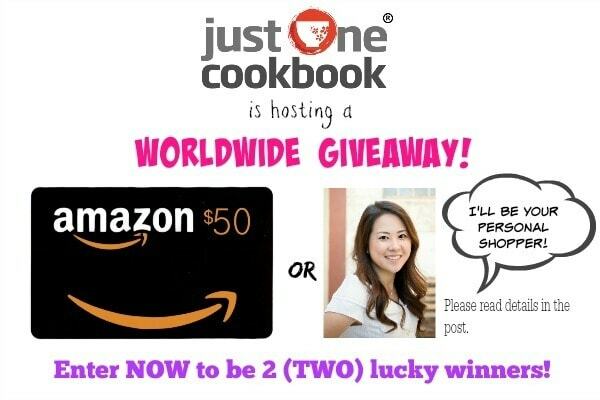 Thank you for those who purchased the eCookbook! I’m glad you and your family were not hurt more seriously by the car accident. I hope your sore neck gets better soon. I love how fresh and tasty these spring rolls look. Hope you like this recipe! Thank you for your kind words, Damiana! Nami-san, your chicken spring rolls are super healthy and delicious. I love your idea to wrap first in the lettuce and then in the rice wrapper. Brilliant! Pinning and sharing everywhere! I love these, except we refer to the uncooked ones as “summer” rolls. They’re so refreshing–especially during summer! And I must try your dipping sauce–it looks delicious! Thanks to the Higher Powers that you walked away relatively unscathed from that accident: do look after your neck and return to old sawbones if the pain and stiffness do not get better. It only takes a second, doesn’t it!! 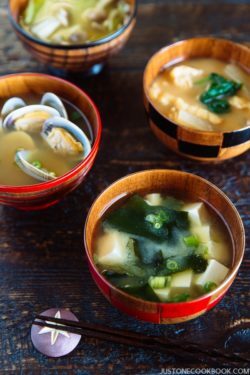 These ‘rolls’ are so fresh and appetizing and I would not hesitate to serve them even in our winter months. *smile* Since I am one of those always talking about health – methinks the sugar is totally OK: I mean the sauce is divided between a number of people and not all used up 🙂 !! Sorry to hear about your shocking accident last night, I’m glad to hear that you and your family are all okay. BTW, your chicken spring rolls recipe looks fabulous! Take care! Thank you for your kind words, Marguerite! I’m thankful that my family is safe! I like how fresh it looks, and the better thing is that you can really use the vegtables you want. The idea is perfect. Whew, close call Sweet Nami! So glad you and family are OK. Please take good care of your neck. I plan to make these spring rolls for our next family gathering – they look delicious! Thank you for the recipe! This looks so fresh, vibrant, and delicious! I love that you tasted it so much for us and that you recommend specific brands of products so we can get the results you do! I love the rolls and that dipping sauce is a must; I think I would just go lightly when I dip but follow your proportions. Hope all is well! Wow, that car accident sounds scary! Glad everyone is OK. Lovely looking spring rolls — just really pretty, and I’ll bet they’re tasty as all get out! Thank you for your sweet thoughts, John! I love spring rolls, these look so good, Nami! I love the fresh vegetables and herbs! I love these spring rolls, Nami! They look so fresh and delicious and perfect for spring and summer when we are craving for less heavier meals. The dipping sauce sounds amazing and I can’t wait to try this 🙂 Thank you! Geez I am sooo glad you are alright. Scary! Also these spring rolls are the bee’s knees. This is a Vietnamese version. Nami, I love making spring rolls this time of the year and packing mine with fresh veggies. . your spring rolls are beautiful!!! I have a recipe coming out next week! 😛 I love trying new dipping sauces so can’t wait to try this one!!! These are just works of art—plus so healthy and delicious! Perfect nibble, but I’d be happy with a plateful for lunch or dinner! Oh, what a perfect weekend lunch! 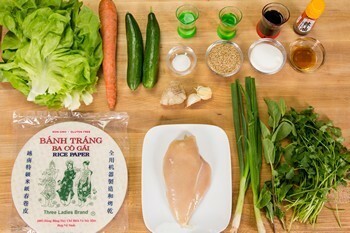 I love Vietnamese Spring Rolls and your chicken version looks amazing! Great protein choice for those who don’t eat pork or shrimps. I’ll definitely make these for my next spring time gathering! 🙂 Thanks for the idea. Beautiful and delicious looking! Wonderful job on the video too. Can’t wait to try it! Spring roll season has arrived! 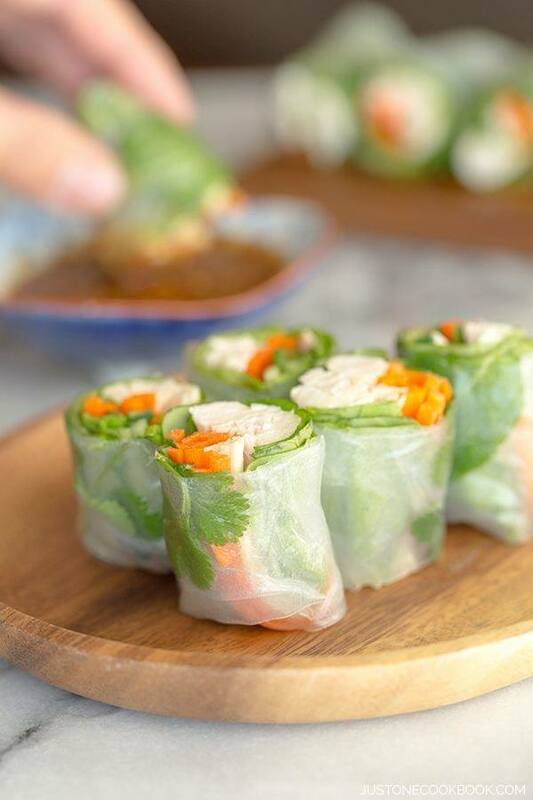 I have almost forgotten about spring rolls during the cold winter months… I love your idea to use bang bang chicken recipe and transform it into a spring roll. How creative!!! I love bang bang chicken, so I’m sure your spring rolls taste heavenly. Fresh and delicious! Those rolls look very appetizing. Nami, such a pretty roll. I love how fresh and filling it looks, sounds amazing. The dipping sauce looks even more perfect. Thanks always for your recommendations and a great recipe as always. Would you recommend packing this in a child’s lunch or will it fall apart/stick? Hi Barbara! When you wrap the spring roll tightly, it will not fall apart. And if you buy the brand of rice wrapper I showed in the post, I’m pretty positive that it will not tear when you try to separate the spring rolls that are stick together. The spring rolls nicely separate (other brands just stick each other forever…. lol). So that’s one thing. Another thing is that you need to prevent from drying. I’d wrap each roll (or two) with plastic wrap, not directly in the lunch box (I haven’t done it, so I’m not 100% positive with putting directly into lunch box… anyone here has done it and want to give us feedback?). I believe it’ll work. If it didn’t, would you please let me know? Make sure the spring rolls/lunch box is kept in the insulated bag with ice pack for food safety. Hope this helps! 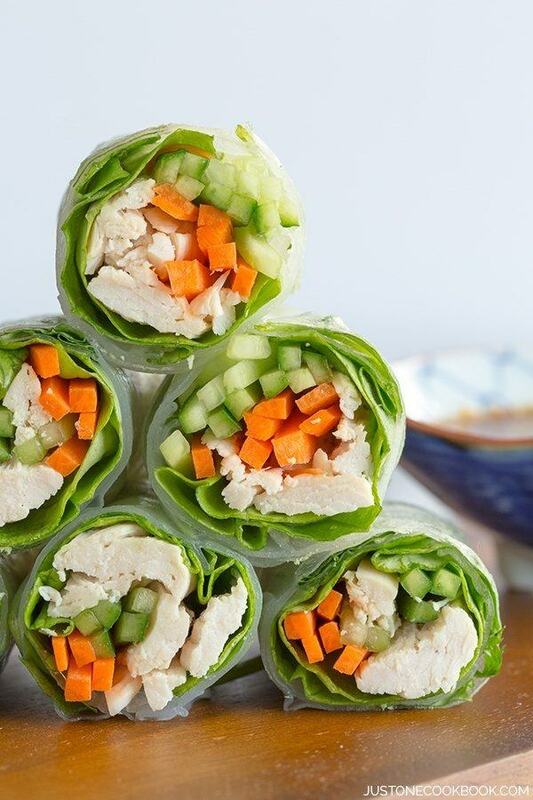 These chicken spring rolls are so healthy and easy to make. This was my first attempt at using rice wrappers. I dropped the first wrapper in a bowl of hot water and when I lifted it out, it was sticking all over the place. I remembered that I had these round plastic “plates with holes”, which I believe are used for making rolls. I put a rice wrapper between two of the plates before dipping it in the hot water for 30 sec. I proceeded to lift the plates of of the water and removed the top plate. I placed the bottom plated on a flat surface and put the lettuce, carrots, cucumber, chicken and coriander on top of the rice wrapper. I rolled the spring roll and put it aside. Great recipe! In my last post, I meant to write that I dipped the plates in the hot water for 5-10 sec. your spring rolls are beautiful! I’ve never been very successful at making them, but now I see what I’ve been doing wrong. Thanks for the video! I was always greedy of spring rolls which I often eat in vietnamese restaurants here in Italy. Now with your instructions I can make them without major problems and also the ingredients seem readily available in local markets. I will try them this weekend! What a lovely meal – and a wonderful and clear tutorial! Love this post. Hi! This looks really delicous. 🙂 I’m wondering if I can make this in the morning and eat it later at lunch (keeping it in a food storage box) since you wrote at the end to keep it wrapped up for up to 2 hours. Hi Kenken! If you use the same rice wrapper that I suggested in this post, the rice paper won’t stick to each other like crazy and you can separate each roll easily. You can pack in a lunch box, then in a lunch bag, make sure to put ice pack to cool the entire lunch box. Can these be made ahead and kept in the fridge?